Experience the mind bending power of single player cooperation. 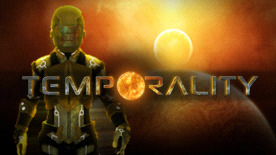 Project Temporality is a third person action/puzzle game built around the concept of allowing the player to play with time. Thanks to our propriety engine Sparta 3D we make the fourth dimension as available as the other three. Just as with a VCR you can rewind time or fast-forward through it seamlessly. Solve puzzles involving lasers, mirrors, force fields, trap doors, platforms, keys etc. Exploit time to do the impossible. Explore the world and see into the mind of its people. We hope that you will enjoy the result of our years of evenings and weekends. This is the key part of the game. You can exist in many parallel timelines using time clones. It means that every time you need a friend's help in the game, you can be that friend. You can spawn a new time clone at any position and time in the game, and once you create a new one it’s there forever. A temporality fielded object is an object that won’t be affected by your time manipulations, because it is inside a field that cancels out all timelines except the original one.